To be honest, I wasn’t that excited when I showed up at Enhance Games’ office in Tokyo’s Aoyama to play Area X, a new area in Rez Infinite for PlayStation VR. I’d played Rez and Rez HD, so I thought Rez in VR would be no big deal. Besides, VR usually makes me sick, and I hadn’t even had dinner. The PlayStation VR release adds new stages called Area X, which unlocks after an hour of Rez Infinite play. About three years ago, Mizuguchi starting kicking around the idea to do something with Rez. “We thought we could do VR, because some people were into it, but this was still early and before Facebook bought Oculus,” says Mark MacDonald, who previously worked at game localizer 8-4 before joining with Mizuguchi to set up his new studio, Enhance Games. Before checking out Rez Infinite in VR, I played through the early part of the remastered game on a 4K television. It looked fantastic, as you’d expect, with super crisp vector graphics. Honestly, it might have looked a little too good, if you remember playing the game’s Dreamcast or PS2 versions on a cathode ray TV. There’s a certain low-fi cool about the original game that naturally gets lost in hi-res. But most people probably won’t care about that and will be thrilled to play a stunning version of the game. The PlayStation VR headset looks good for a VR headset, but obviously it cannot compete with a 4K television. The new Area X stages are built around a particle motif. Mizuguchi wanted to generate lots of particles and then let players interact with those particles and the music. On the PS VR, that aesthetic shines. I would rather play Area X on the PS VR than on a 4K television, because I believe that visually those stages better suit the headset’s look. Even as my eyes were still adjusting to the resolution change, I blurted out a “Goodness!” as I plunged into Area X. I was instantly transported into another world—the world of Rez. These enemies reminded me of goldfish. It was an incredible world. I never felt sick or uncomfortable, and as I played through the demo, I didn’t want to leave. What has always been most appealing to me about good video games, movies, TV shows, and even painting is their ability to transport you into a flat two-dimensional space that is surrounded by borders. VR, I’ve always thought, is a bit like cheating. So, if a VR game is going to overcome that skepticism, it needs to be special. Area X is special. Certain sections of Area X are the most Japanese video game experiences I’ve ever had. By “most Japanese” I mean the way they refer to certain experiences you have living (or, yes, visiting) Japan. In sections, there are explosions that look like fireworks—suddenly it’s summer in Japan, when massive firework displays are held throughout the season. Perhaps because they pack the gunpowder differently, fireworks in Japan have always sounded differently than the ones I heard on the Fourth of July in America as a kid. There I am, in this virtual space, flying through these particularly Japanese fireworks and feeling their heat on my face. The use of particles in Area X opened up an entirely new experience. The game’s enemies looked like Japanese gold fish, and the boss was a long, slender dragon with a body made from drums. It felt incredibly Japanese because it wasn’t explicitly Japanese, as if this was simply the result of Japanese game developers making a stage instead of going out of their way to make something “look Japanese.” These motifs and feelings are part of their experience growing up and living in this country, so of course they would inspire certain elements in the game. It’s difficult to make out, but a dragon-like enemy flies through the air. After I’d finished the game, I noticed a wall covered with concept art, which included early, previous designs that referenced the bell ropes at Shinto shrines. In this older design, the enemy’s name is “Sensu,” which in Japanese is 扇子 and means “folding fan.” The Shinto bell ropes are in the lower right corner. Statues of dragons are typically located in the area of the shrine where you wash your hands before approaching the main sanctuary. Shintoism is centered around purification, and dragons have deep water associations in Japan. In Area X, these sort of motifs are abstract, but that feeling of Japanese summer—albeit a digital spaced out version of it—were almost tangible in VR. I told Mizuguchi that I didn’t think he or his team set out to make a game about Japanese fireworks and Shintoism, but, from the particle motif, a series of natural associations were certainly made. However it happened, these areas opened up deeper meanings for me than just abstract shapes and cool music. The gestation period for Rez Infinite was long. Mizuguchi thought about it and worked on concepts for two years, and development, handled by Yokohama-based Monstars with team members from Rez, Lumines, and Child of Eden, only took six months. Mizuguchi has collaborated with these devs for years, so they were on the same page from the start. 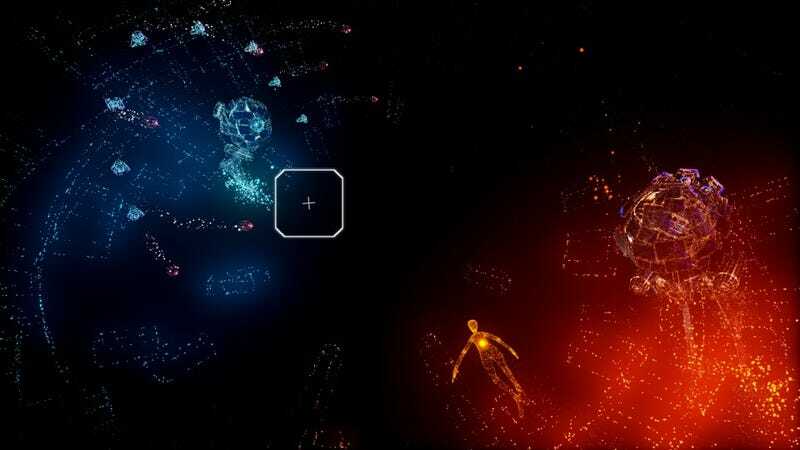 Rez Infinite will launch on October 13. It will have a new remastered version of Rez and a VR version of Rez. But Area X on its own is worth the price of admission. It’s short, only twenty minutes or so, but worth every second. Area X isn’t just an add-on or a proof of concept—it’s a statement of what this small studio can do.